The new Law Society of England & Wales’ Pro Bono Manual: A practical guide and resource kit for solicitors was launched recently as part of UK National Pro Bono Week. It is based on the Australian Pro Bono Manual. The new Pro Bono Manual is a practical ‘how to’ guide for law firms in the process of establishing pro bono legal practices. It is also a useful resource for smaller firms, advice bureau services and individuals undertaking pro bono legal work. The new Pro Bono Manual is based on the recently released third edition of the Australian Pro Bono Manual and has been adapted for use in the local context. This is the second jurisdiction to develop a pro bono manual based on the Centre’s flagship publication – the first being The Law Society of Singapore’s Pro Bono Guide for Law Practices in 2012. 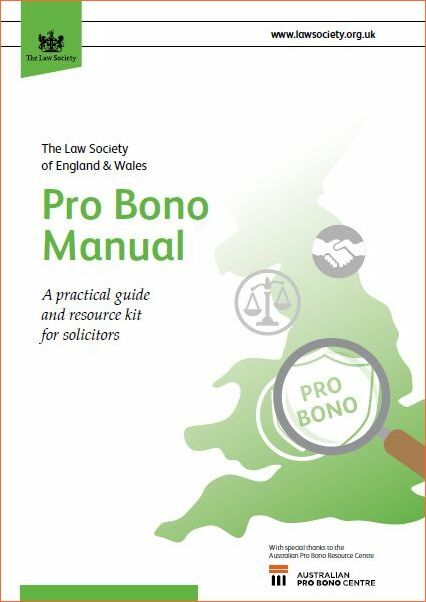 The Centre congratulates the Law Society of England and Wales and all those involved in the publication of the new Pro Bono Manual.